• Their own leadership behavioral tendencies through a personal Leadership Practices Inventory (LPI), revised in 2017. • How to explain and interpret the LPI. • Workshop agenda and processes for facilitating The Leadership Challenge Workshop®. • Experiential activities that illustrate the practices and make them come alive. 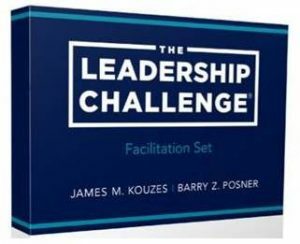 • How to conduct a powerful Leadership Challenge Workshop®. • Complete a Leadership Practices Inventory (LPI) and receive 360° feedback (if one has not already been completed by the participant). • Dive deeply into each practice and receive experience based insights from highly experienced facilitators. • Discuss customized approaches, and learning methodologies which best fit each person’s unique circumstances. • Practice debriefing experiential activities. • View and discuss suggested videos. • An in-depth knowledge and understanding of the Kouzes & Posner leadership model (The Five Practices of Exemplary Leadership®). • All the elements of a successful leadership development intervention with guidelines for customization. • Increased confidence and competence in facilitating the workshop. • Certificate of achievement as a qualified Leadership Challenge Workshop® Facilitator. The tuition for the program is $2950 per person (nearly $1300 of this is for the newly revised, comprehensive Facilitator Set – which includes materials for four integrated offerings: The Leadership Challenge, Leadership is Everyone’s Business, The Leadership Practices Inventory, and The Challenge Continues – a $2200 value.) Quantity discounts are available, as are early bird discounts for enrollments up to 30 days prior to the start date. Call Connie at ILA for details – 513.755.7112. To register, call Connie at 513-755-7112 or contact ILA.